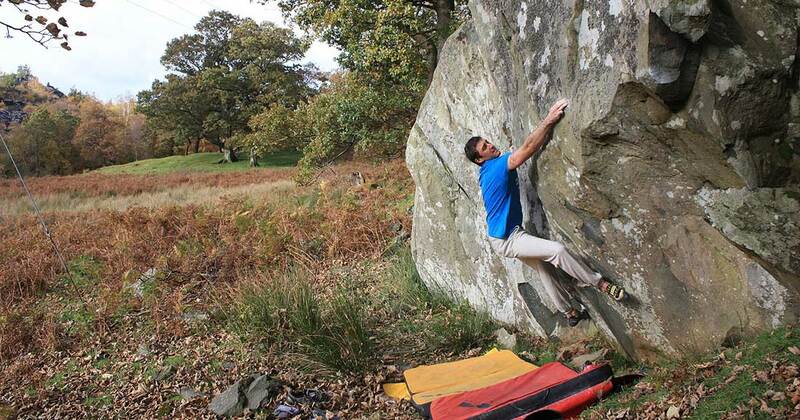 Conditions: The Ogwen Bank Buttress has a sunny aspect and is quick drying. It is quite sheltered and can get midgey on summer evenings. The quarry also has a sunny aspect but it is less quick to dry after rain. Approach: Park at the lay-by on the A5 road next to the Ogwen Bank caravan park entrance. Walk along the side of the A5 (away from Bethesda) for 50m and cross a metal gate on the right into the field running adjacent to Afon Ogwen. Follow a vague path through the field until the Ogwen Bank Buttress comes into view on the left, just below the road wall. 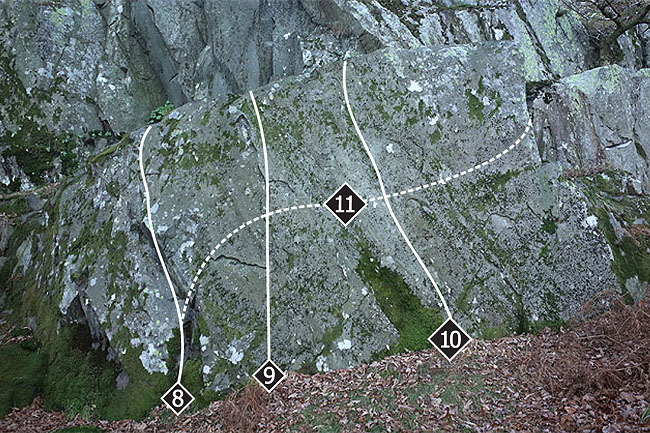 The right arête of the buttress has been climbed from sitting at 6B, but the protruding block somewhat spoils the climbing. 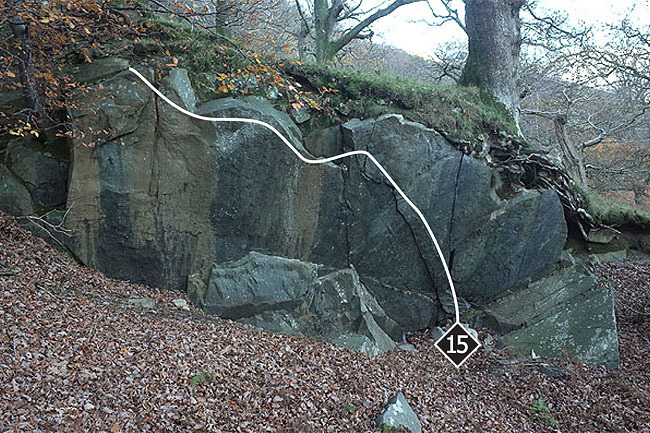 The slabs and walls in this old quarry are well worth a visit, especially for the lower grade climber. It is situated almost directly above the Ogwen Bank Buttress on the hillside just above the A5. To reach it from the parking lay-by next to the entrance to the Ogwen Bank caravan park walk along the A5 for 150m until you see a series of walls just above the road in an opening. 30m farther along the road a gated entrance leads back up left past a second gate into the old quarry. Up at the top left of the old quarry is a high wall. Follow the diagonal rail up left and mantel out onto the vegetated slab carefully to finish. At a lower level, the partially moss-laden slab gives a few decent problems. 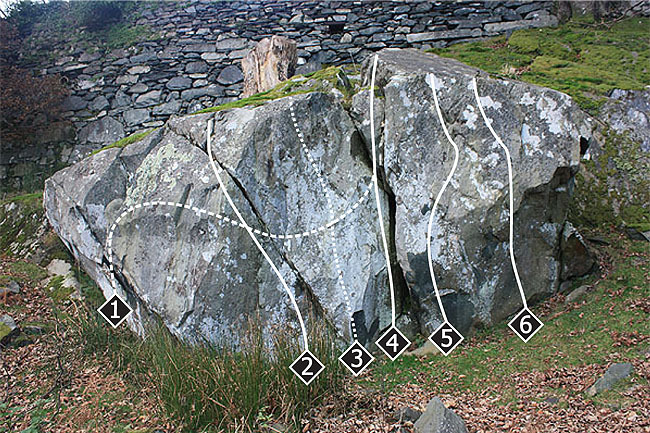 The left hand line on the slab, searching out clean holds between the mossy patches. The layaway flake gives a good problem. The central line with a reachy finish. 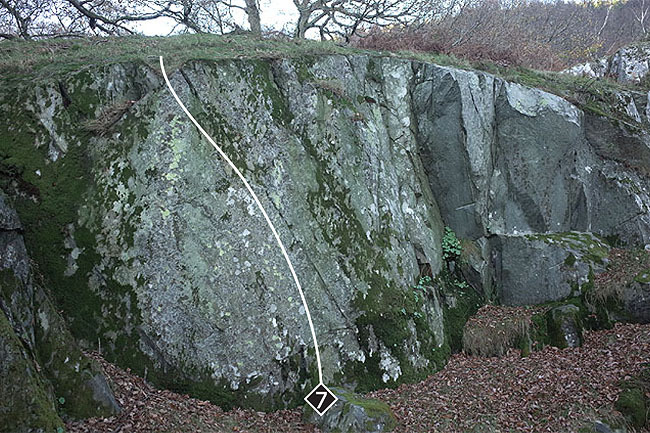 The traverse of the slab is an obvious challenge. 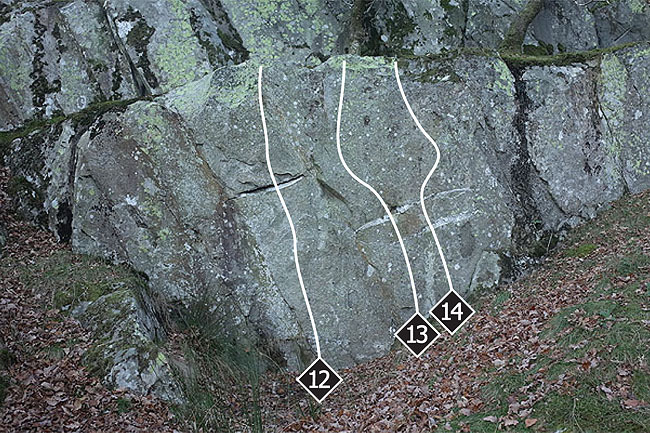 It was originally done right-to-left, however it actually climbs better left-to-right staying below the top to rock on to the ledge on the arête. The wall just up and right is slightly spoilt by the sometimes boggy landing. From the horizontal slot pull up to a positive hold before gaining the top. Start sitting with both hands in the porthole. Move up and gain a flake for the left hand. Step directly into the porthole and rock up for the top. Start sitting with left hand in the port hole and tic-tac up to the top. A harder direct eliminate uses a smallish edge for the right. The lower right hand section of the quarry has one worthwhile problem.